There will be problems with the lunch buffet. And, yes, we are only human. The WIFI wasn’t working properly (at least not at the beginning) and we were facing problems with the buffet. I can’t remember how we dealt with the WIFI, so let’s skip this for now. But for the buffet problem we found a quite smart solution! My colleague Markus Gärtner once told me that buffets are optimized for the needs of the caterer (easy to set up and replenish), but not for the needs of the hungry guests (filling their stomaches really fast). This was most certainly true for our event! What happened? Queues! And we hate queues!!! If you read the Kanban book by David Anderson, you know that the idea of building a Kanban System for Knowledge work emerged when David entered the Emperor’s Garden in Tokyo. At the entrance, a plastic card is handed to every person. And he is supposed to return this card after leaving the garden. The total number of cards circulating is limited to a certain amount, and this limited number of token is used to make sure the garden would never be overloaded with too many visitors. What would happen if we used Poker Chips for limiting the number of people at our buffet? Would this lead to decreased lead times and better custumer satisfaction? This was a conference on Lean and Kanban – so let’s give it a try! So at the morning of the second conference day, I showed this stop motion movie from the first conference day to the audience, which identifies the problem quite clearly. My Friend Markus Andrezak and I had a short discussion about how to do this and decided to limit the number of Poker Chips to a total amount of 80. This was a wild guess, but we agreed to adjust it on the fly if needed. The catering area had two entrances, so the two of us guarded either door and handed a Poker Chip to everyone entering the area. As soon as they left, we reminded them kindly to return the Chip to us. Every time all Chips were taken, we blocked the doors and asked the people politely to wait until someone else had left the area. The whole thing took only 20-30 minutes. After this, about 80% of the attendees had eaten. Se we declared success and ended the whole thing. There was less stress in the catering area. The lead time did decrease. One reason was lower WIP. The other reason was that people in the catering area were aware of the fact that the Poker Chip in their pocket meant that there were hungry people waiting outside. In order to make this work, it was important that people knew what was going on and what policies were in place. I think many of them were interested in understanding the process, because they wanted predictability: When will I be served? What does it mean when the doors are blocked? It was a lot of fun, thanks (once again) Markus! Now that you know about last year, you are really interested in what will happen at this years‘s conference in Vienna, right? 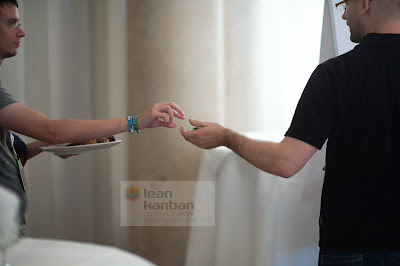 There‘s only one way to find out: Register now for Lean Kanban Central Europe 2012! An approach to improving the experience of using a buffet that relies on capping the number of people with concurrent access. It is like the nightclub or museum management system in which a fixed number of visitors is allowed in, and the next one only allowed in when one leaves. This is in the same spirit as the purely production control approach to Lean, in which you change production planning and scheduling but you don't redesign the production line itself. For pointers on buffet design, see http://wp.me/p1UTIj-28. Credtis where credits are due: Mary Poppendieck complained about the queue effect at the eating buffets at the Agile Testing Days 2009, and explained the sub-optimization of lunch serving vs. people getting something to eat for. We had the same issue at ACE! this year, and following your example, solved it in the same way. It took 40 minutes to serve 300 people on the first day. On the second day, I asked Paweł Brodziński to prepare a pre-lunch lightning talk on Little's Law (he did a great job!) and then, lacking poker chips, we raided the cloak room for coat check tags. Some people complained that a queue formed at the kanban bowl rather than at the buffet, but it was a voluntary queue and many other passed the time talking. In the end, all 300 people were served 20 minutes faster than the previous day. thanks for your comment! Good to know that this worked for you as well! So people don't queue for food, they queue for poker chips. Great. b) People stood in small groups having conversations in the lobby while having a look at the small queue every now and the. This was way more relaxing than queuing up in a long queue.